During Farnborough International Airshow, the Defence Secretary, Gavin Williamson launched the long-anticipated combat air strategy and used the Airshow as a platform to unveil ‘Tempest’, a concept for a multi-role fighter aircraft. The combat air strategy announcement and the reveal of the concept come after several years of revised thinking on the UK’s future combat air requirements; with the concept being an indicative to what may eventually succeed the Typhoon in the late 2030’s. What made this announcement particularly significant was that alongside the unveiling of ‘Tempest’ and Team Tempest (BAE, Rolls-Royce, MBDA and Leonardo), this is the first manifestation of the government’s view for the future of combat air. Farnborough International Airshow also provided the ideal platform to launch this significant step-change to the industrial landscape. A show where the aerospace and defence industries are highlighting the best and the brightest of future aviation, the combat air strategy also giving a vision of this future. Stopping short of making concrete decisions, the strategy gives MoD’s interpretation of the current industrial and technological landscape and speculates as to what this will need to be capable of in the future to be able to deliver a successful programme. 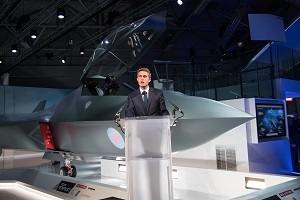 The unveiling of ‘Tempest’ was a clear signal showing that all corners of the defence industry are ready and willing to take on the challenge of designing and developing the next generation of combat aircraft, as well as highlighting the UK’s ambition to remain in the top-tier of defence-aerospace manufacturers. The strategy released by MoD allows industry room to invest, discuss, and create ideas for the ways capabilities can be delivered in the future. It is clear both the Government and industry understand the importance of sustaining a commanding military air presence and we look forward to seeing how the ‘Tempest’ concept develops and comes to life over the coming decades.